The Age of Empathy: Nature's Lessons for a Kinder Society by Frans de Waal. 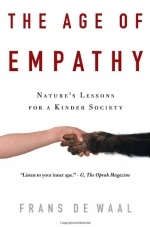 The 9th work by Dutch-born Frans de Waal, now Professor (and a few other titles) at Yerkes National Primates Research Center in Atlanta: The Age of Empathy - Nature's Lessons for a Kinder Society. Selected as one of the 100 most influential people by Time in 2007, Frans' work can be characterized as explaining altruism and empathy from a Darwinian perspective. Fascinating, to say the least, and very encouraging for our species' future. Recommended!